Premium Compatible Label Tapes for the Dymo LabelWriter 450 Twin printer. 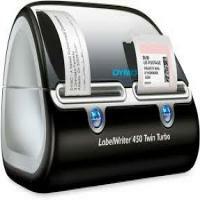 The Dymo LabelWriter 450 Twin is the best solution for offices and professional usage. This printer does not require ink cartridges or toners but uses Dymo LabelWriter 450 Twin Label Tapes which significantly reduces the running costs. Having a weight of 654 grams and a dimension of 127 x 187 x 134 mm, the Dymo LabelWriter 450 Twin can be easily placed anywhere in the office or workplace. The rolls are changed by removing the current roll and mounting the replacement roll on the spool before putting it in the printer. This printer uses one of the most capable and easy to use software that is the Dymo label software which lets one create and store label formats with a variety of features. The Dymo LabelWriter 450 Twin is very good at printing multiple labels. This printer can print at 68.5 labels per minute and can print as fast as 71 labels per minute which is quite good for a printer of such a range. This printer has a maximum resolution of 600 x 300 dpi and is compatible with Windows and Mac platforms. Being a good solution for office and professional use, this printer uses Dymo LabelWriter 450 Twin Label Tapes which reduces the running costs to a great extent. This is a quiet printer and can print good quality of images and graphics at a very fast speed. But it does not have impressive networking capabilities and it lacks an LCD display and indicator lights too. Q. My Dymo Labelwriter 450 twin is printing blank labels when I print. How can I fix this? If the labels are manufactured incorrectly, the sensor won’t know when a new label begins. As always, if you cannot get your printer to work on your own, you can contact the customer service team for help. Q. I want to print two labels on a single click. Can I perform such operation with my Dymo LabelWriter 450 twin? A. Yes, the LabelWriter printer holds two Dymo LabelWriter 450 Twin Label Tapes, so you can print two types of labels without worrying to change the label roll. You can print labels directly from the desktop with QuickPrint, and from Microsoft Word, Excel, and Outlook with the DYMO Label. Q. It works, but sometimes my printer is not able to detect the label tapes loaded in the printer. Please suggest me how can I improve this? A. We are constantly working on to produce the highest quality documentation for your printer. Make sure you are using high-quality Dymo LabelWriter 450 Twin Label Tapes for printing labels. Using the low-quality ones are frequently not detectable by DYMO printers. Using the defective one can also void quality. Q. Does the compatible label tapes you offer are good for printing address also? A. Yes, the range of Dymo LabelWriter 450 Twin Label Tapes we provide works great for printing both address labels and plastic marking labels. Q. How quickly can I get my compatible Dymo LabelWriter 450 Twin Label Tapes? A. Your order will take 1-2 business days in production once we received the order and your approval, along with all the relevant information to process your order. Upon completion, your order will be shipped to the address supplied to us, via our courier partners, Fastway Couriers. Q. What is the expected shelf life of the Dymo LabelWriter 450 Twin Label Tapes? A. If they are stored safely, the shelf life for LabelWriter label tapes is 18 months. To prolong the life of the tapes, store them in cool, dry place and in the black bag when they are not in use. Q. How buying a Dymo LabelWriter 450 Twin printer for the office proves to be a great pick? A. The device itself seems of decent quality design and manufacturing. If you send out a lot of letters or packages this proves to be an ideal addition to your business. It provides a quality professional look to your outgoing packages. Labels look good and do not smear. The ability to print out two different sized labels is very handy and can be achieved without complication. Q. Why is the ink ribbon coming out with my Dymo LabelWriter 450 Twin Label Tape when I print a label? A. There may be a slack with the ink ribbon in the tape cassette. You need to remove the tape cassette from the label maker, making sure that the label and ribbon are taut across the mouth of the cassette and that the label passes between the label guides. If necessary, turn the ribbon rewind spool clockwise to tighten the ribbon. Insert the cassette and press it firmly until the cassette clicks into place. Make sure that the label and ribbon are positioned correctly. Q. I am searching for a printer that efficiently prints labels? How purchasing Dymo LabelWriter 450 Twin will solve my problem? A. The Dymo LabelWriter is an easy to use with fast printing speed and it works so adequately that it does not waste any labels. The printer utilizes advanced thermal printing technology to print on specially treated, heat-sensitive label tapes. This implies you will never have to replace toner or cartridges to print labels.